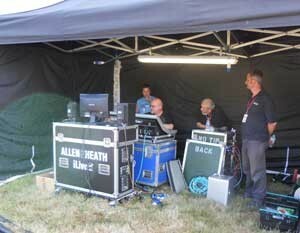 Kent-based PA company, SRD Group, was appointed to provide a sound reinforcement system for a large scale 16,000 capacity outdoor classical music event, selecting a range of units from its stock of Allen & Heath iLive digital hardware and using the latest ‘DualRack’ capability. The varied programme included opera, musical theatre, military band, traditional choral, and a headline performance by the Royal Philharmonic Orchestra conducted by John Rigby and accompanied by soloists Wynne Evans (tenor), Elizabeth Watts (soprano) and Richard Morrison (baritone). 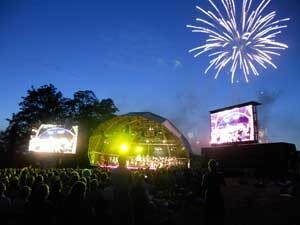 The evening was also narrated by actor Robert Powell, featured the marching band of the Brigade of Gurkhas, and included a fireworks and cannons finale. "With crowd coverage extending 365m deep x 100m wide, and due to the predominantly orchestral material, audio requirements reached 180 inputs. To compound this issue, the FOH footprint needed to be very compact due to crowd sight line issues," explains SRD’s MD, Stuart Roberts. "iLive was the obvious choice, as its flexible, distributed audio architecture makes it easy to build high capacity systems within a small footprint." The Royal Philharmonic Orchestra was mixed on a separate system by specialist classical sound engineer, Ian Barfoot, who provided four stereo subgroups to both the FOH and Monitor consoles, which took pressure off the engineers and provided a better audio balance within the Orchestra. The main FOH system consisted of an Allen & Heath iDR10 modular MixRack loaded with 64 inputs - 56 analogue and 8 digital – connected to an iLive-80 Control Surface with a mixture of analogue and digital local outputs. There was an EtherSound digital split to the Monitor system, which comprised an iDR0 miniRack connected to an iLive-112 Control Surface with 24 analogue local outputs. The orchestra system consisted of two iDR10 MixRacks loaded with 128 inputs - 120 analogue and 8 digital - running in ‘DualRack’ mode, feeding 16 digital outputs - 8 digital feeds to the FOH system and 8 to locally required outputs - with 16 analogue outputs as back up. All the MixRack and Control Surface connections, except the monitor system, were via Gigabit Network Smart Switches with fibre optic interfaces over deployable tactical fibre cable. WiFi networks were installed on all of three iLive systems to allow remote access to control functions via iLive’s Editor control software. All the iLive systems and network interfaces were powered via UPS units for protection from variations and interruptions in the temporary AC supply. "Everything worked according to plan," confirms Barfoot. "iLive is still one of the best sounding, most intuitive digital desks around, which is why it was chosen. With the added flexibility of ‘DualRack’ mode, the channel count is doubled per system without compromise, making the choice of iLive even easier. After the event we received a lot of compliments from the artists taking part who remarked on the quality of the monitor sound, and to the best of our knowledge there were no complaints from the crowd regarding any issues with sound or coverage. We would definitely do it the same way again - the combination of good input sources with an excellent mixing console makes every ones job much more simple." 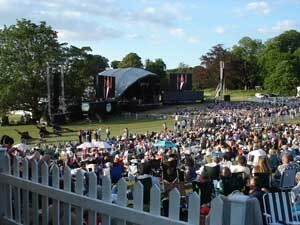 In picture: the Leeds Castle crowd and stage; fireworks displaying during the finale with the Royal Philharmonic Orchestra; FOH during set up with FOH engineer, Ian Barfoot, and the SRD team.